Most adults these days spend time wishing that kids would spend less time hanging around the streets, or sitting indoors playing computer games. Some of us complain...but some of us get up and do something about it. The Sport for Streets Initiative is a charity that operates out of unique vehicles and is spearheading the Street Hockey development project with their converted Sports Ambulance. This features a sound system, floodlights and is filled up with Skates and protective equipment for young people to use for free. The initiative have been using SFR skates for the youngsters to use, while learning how to skate with confidence and safety, and we think that this is something we want to see more of. Giving children the time and patience, and teaching them a skill that will not only be fun, but also keep them fit and healthy can only be a good thing! We want to highlight this great organisation and help them to gain as much awareness as possible. Over the past year they have offered primary schools across Oxfordshire free school taster sessions where they bring along Great Britain players to introduce pupils to Skating and Street Hockey. At a minimum, every child finishes the session being able to skate forwards, backwards, stopping and turning on both sides with knowledge and being able to demonstrate that they can fall in the correct manner and control their speed. 90% of the pupils will partake in a Street Hockey game against their classmates. 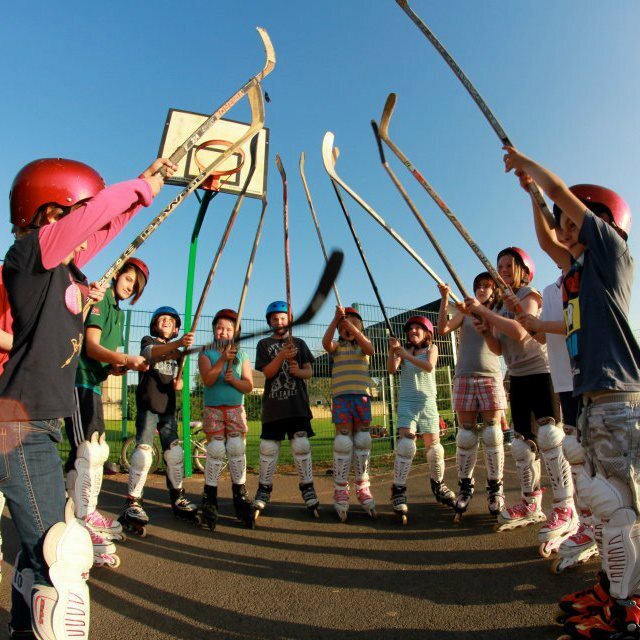 Sports for Streets offer these schools an after school club and direct links to local clubs where the pupils can participate in skating further. Longfields School of Street Hockey from Dave Edwards on Vimeo. The initiative have put a large project together and had this sponsored by Ovation Systems and Sport England. This project will work across the South of England from two locations. The target for this is to run 400 free Street Hockey sessions in 70 locations with the aim of developing local clubs in these areas for young people to access and develop the sport further. The throughput of players for this project is targeted at 12,600 people trying Street Hockey on at least one occasion with a retention rate of at least 6000 returning players. They need to reach this target for the project to be fully successful, so you can help by spreading the word. Sports for Streets have just been sponsored by Central London recruitment firm SThree to offer Street Hockey and life skills workshops to six schools in Brixton and Camberwell in South London, which has been indicated as the most deprived area in the country. These sessions will inspire secondary school pupils to learn positive skills for the workplace through the sport, leave behind an after school program for them and culminate in a tournament against other local schools. This Sponsorship has also funded the IIHF Team GB for their 2013 campaign for promotion into pool A of the World Championships. This project will offer 780 young people the opportunity for participation in sport in South London. You can really help make a difference by getting involved, getting your kids involved, sharing this blog post and by 'liking' the Sports for Streets Initiative Facebook Page. Please spread the word and help this great charity to give more and more young people, great opportunities to develop their skating skills.